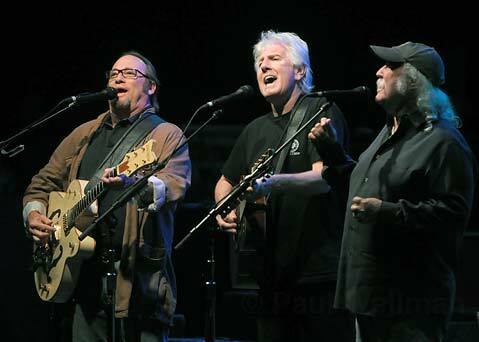 Only a year after playing to a sold-out crowd at the Santa Barbara Bowl, David Crosby, Steven Stills, and Graham Nash returned to deliver a finely crafted show, full of Woodstock nostalgia, last Thursday night. The legendary folk trio has been playing together for 40 years, and the crowd full of graying, tie-dye-clad hippies that turned out last week only gave proof of the band’s longevity. The three share a brotherly dynamic on stage, helping their two sets flow by seamlessly. While the recognizable cover songs, such as the Stones’ “Ruby Tuesday,” left the stadium in a toe-tapping frenzy, it was their electrifying “Wooden Ships” that sent fans back to a psychedelic decade where peace and free love reigned. In true hippie fashion, their performance included a splash of activism. Lamenting the Japanese whaling industry, Crosby introduced their song “To the Last Whale,” giving praise to the indie documentary The Cove. After closing with Buffalo Springfield’s “Bluebird” and “For What It’s Worth,” the group was beckoned back to the stage by incessant whistles and a standing ovation from the packed amphitheatre. The enthusiasm prompted CSN to close the night with the powerful anti-war anthem “Teach Your Children,” proving that certain songs, like certain bands, never go out of style.